What have I learned about designing logos over the past 12 years in business? Plenty. From time to time, I'm going to post some lessons learned about logo design. Lesson 1: Always remember who your customers are and design everything for them. In The E-Myth Revisited, (required reading for all entry-level business owners, btw) Michael Gerber suggests that start-up entrepreneurs almost always name their companies after themselves. Why? Because business owners cannot see a distinction between their inner selves and their companies. I know this is true because this is exactly what I did - my company is named Julie & Company, after all! End up working IN their businesses rather than ON their businesses, which leads to burnout, misery, hopeless, and failure. Take every business success or disappointment personally because they've invested their very soul in their companies. Believe the business should reflect their inner being - and this includes most particularly their branding. Creating a brand to match your internal self is simply ineffective, bad, wrong, dumb, meaningless. Your logo is NOT yourself, just as your business is not yourself. Which takes us to the primary purposes of a logo: to attract customers to your product and/or services and to then get your more attention and make you more money. That's why you go to all the trouble to brand your business - so you can be successful. Period. So given this, what is the most important thing you should do when designing a logo? Make it customer focused. Design the logo to meet the expectations and desires of your prospects and clients. Get in their heads and figure out what look and feel you need to have to get their attention. Then remember that whatever that look and feel is doesn't have anything to do with who you are as a human being - and that's just fine. My corporate colors are saturated hues of rust, avocado, and plum - usually more color than most of my clients want for their own businesses. But this color usage shows that Julie & Company has the creative spark that they need. I once had a client over to my home. She was disappointed that I didn't live in orange, green, and purple land. I don't. My home is much different from my corporate online presence. My home is about me. My business is about my customers. 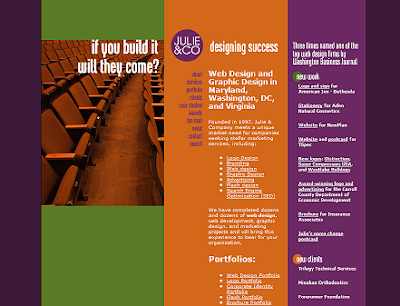 The Julie & Company website doesn't look like other designers' sites and for good reason. I don't want us to look like everyone else. Julie & Company needs to be distinctive but in the right way. Instead of having a Flash website with lots of gizmos whirling around, I tell our corporate story in a solid, steady, business-like way. My clients aren't Coke or Nike and almost none of them sell to teenagers or young adults. They are instead B2B or B2G firms who generally despise gratuitous animation. Therefore, on my website, I give them straight HTML pages with a little Flash animation, just enough to get them interested but not so much as to make them (of me!) epileptic. My customers want sober grown-ups with 20 years of business experience to help them - not post-adolescent kids who make every business look like an alternative rock band. Which brings me to another point: don't ask your teenager for approval of your logo. Kids do NOT want to see what ADULTS want to see in terms of branding. A perfect example: for Christmas, my 53-year-old boyfriend asked for a black belt to wear with dress slacks. He got two belts, one from me, a 49-year old woman, and one from his son's 17-year-old girlfriend. Guess which one I picked out? And guess which one he'll actually wear with his dress slacks? Bottom line: See your business as you want others to see it and then create a logo that matches that vision. That's the bottom line to your success, too.